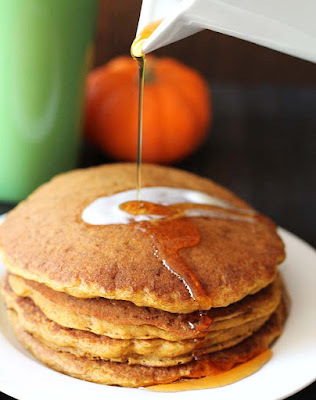 In my opinion, one of the perfect breakfasts to have during the fall is vegan gluten free pumpkin pancakes. Topped with a little vegan butter and real maple syrup? Maybe a little vanilla bean coconut whipped cream? So dreamy. Treat your family to a batch of easy-to-make, fluffy vegan gluten free pumpkin pancakes. They're packed with pumpkin spice flavour everyone will love. Whisk milk, pumpkin puree, oil, vanilla, ground flax seeds, and maple syrup together in a medium-sized bowl, whisking enough to incorporate the flax seeds. Let sit for 5 minutes. Whisk flour, baking powder, baking soda, pumpkin pie spice and salt together in a large bowl. This recipe makes 8-10 pancakes, depending on how large or small you make them. Calorie count is for 1 of 8 pancakes without toppings. It's important to know that all gluten-free flour blends use different ingredients and ratios, so results will always vary when you use different blends. I have never used any other brand of flour to make these pancakes (other than Bob's Red Mill), so please know that your results may not be the same as mine if you substitute with a different flour. 0 Response to "Vegan Gluten Free Pumpkin Pancakes"